There use to be a glue stick that was called a post a note. Easy to remove the paper off the wood. You can use lightly applied gluestick to the back of a copy and cut the balsa/paper part out, then remove the paper. Yup. There's lots of methods out there, aren't there? Just gotta find one that works for you. I'm thinking I might give his idea a shot on my next scratchbuild. Will post here how it works out. Still trying to transfer the plan to balsa sheet. Didn't have much luck with the OfficeMax/thinner route. I found a reference to something called ChartPak blender, so I ordered one from Amazon. Two day shipping. There was a YouTube video showing the use of this pen, but I am sorry to say that it didn't turn out this way for me. Better than the thinner method but still leaving only a faint outline. Usable maybe, but not great. Unless something comes up, I'll be sticking with gluing the plan to the sheet and then cutting it out for use. I just read a build article where the fellow suggested copying the printwood with your desktop scanner. Save the file as a pdf or jpg then print it directly onto Avery or Office Depot mailing label sheets. Get the full page sheets if they're available. Stick the entire printed label to your sheet balsa, cut out the formers and then peel off the labels. Since I just read this a day or so ago I haven't had time to try it yet but it seems like a great idea. AK - You are right about using this tool in tight places but I did use it on my peanut Buffalo build in the Cookup, takes a bit of practice but it comes quite quickly. Now you have a depth sander with stops and all your notches will be the same. Thanks, Mike. I think a tool like this is probably more useful for larger models. I typically build in the 18" wingspan area and sanding devices are hard to control in the small spaces around formers, etc. Also, on a side note, using CA glue makes the job even more difficult since the CA wicks into the formers and sometimes makes cutting or sanding the notches that much harder. AK - Looked for the notcher discussion but couldn't find it so whipped out a quick pic. The basic premise is to sand a notch to a specific width and depth. 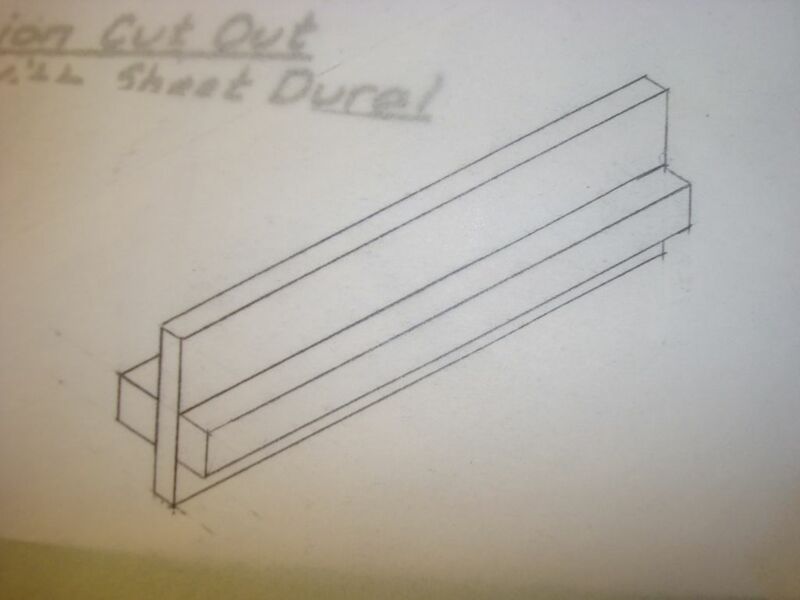 On the drawing, the two blocks are depth stops and can be set to any depth needed and the part below the blocks represents the width and depth of the cut. There is no scale here so hopefully it is explanatory. The thickness of the tall part will be the width of the notch you want to cut, and as mentioned, the distance from the bottom to the blocks can be any needed. To attach sandpaper to the bottom of the sander is very simple. Cut a piece of sandpaper wider than the width needed and glue it to the bottom of the sander. I have most of mine 1/16" x 1/16" but make whatever you need. After the glue is dry, cut the sandpaper to the sides of the tall part and you are done. Now you have a depth sander with stops and all your notches will be the same. About cutting notches. I cut the first and the last one while the formers are still on the cutting board. Then I cut the rest after gluing the formers in place. I can't afford to use that much ink so I just print duplicate parts sections and cut them out and glue stick them to the balsa and cut them out. I can usually save a bit more balsa too....cheap old guy on fixed income!!! This is the best method I think you can use with some suggestions. When you cut out your parts with inside curves, cut the inside part first, then the outside. I use a straight edge and my craft knife to cut around the outside edges (this creates little fillets), sand the final shape and peel off the template. I also don't cut the notches for stringers until after assembly since they are usually misaligned. When the part is sanded, I use a pencil to transfer the locations of the stringers to the edge of the part. This at least gives you some indication of the location of the stringer and gives you the opportunity to correct it before committing to a cut that may be out of alignment. Tom also taught me to use my knife like a pencil to cut the inside curve lightly cutting a bit deeper on each pass. This gives you some really nice clean lines. Anticipating your next question relative to cutting the notches for stringers, there was some discussion about making sanding tools for the notches. I'll look for it and post it here. .cheap old guy on fixed income!!! I want to thank you now for how you been so generous with your time to answer my questions which, I am sure, have been asked many times in the past. Works well with laser printers because of the heavy application of toner through the heat process. For Deskjet type printers the ink must be applied heavier like for printing pictures using the black and white setting. Also acetone or finger nail polish remover rather than thinner usually works better. After reading as many threads on this subject that I could find, I decided to give it a try. Off to OfficeMax to copy the plan, WalMart to get the thinner, and then back home to see if this actually works. Not too well I have to say. I tried the instructions...damp rag, firmly blot, translucent plan, etc and all I got was a faint outline on the balsa sheet. Not anything like the pictures show, leaving me wondering what I had done wrong. What I did find in the forum discussions was an alternative method using ChartPak blender pens to transfer the plan. So I've ordered one from Amazon and should have it by the weekend. Otherwise, unless I can figure out what I am missing, it will be back to sticking the plan on the balsa and then cutting it out. It's worked for me in the past. I often just copy the plan at the copyshop, make several! Then cut out formers and parts, rubber cement or spray adhesive them and position on balsa sheet, or 1mm plywood for bulkheads and station formers. Let dry and cut to the lines with sharp pointed scissors, then use jewelers files to file the notches for stringers... you can cut the center out with a scissors or razor knife... then peel off the plans paper! I Copy the parts on a toner-type copier. Pass the hot iron,pressing the copy and the print is transferred to the wood. Careful to use good the wood!